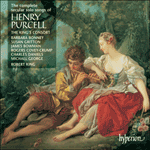 This is probably one of Purcell’s earliest surviving songs, especially as scholarship has to doubt the attribution of most songs written before 1678 to the young Henry (giving their authorship instead to his father, also named Henry). This song was first published in 1679 in Choice Ayres and Songs to Sing. The subject matter – a man who has had enough of women – is not serious, and Purcell’s setting is suitably boisterous. Most of the ‘women o’ the town’ have a ‘pox’ (an infection) of inconstancy, we hear, and no sensible man would ‘trouble his brains’ to get them into bed with him. The subtext also contains more serious undertones of the real diseases which could be caught (and were extremely prevalent in the unrepressed atmosphere of the post-Restoration period) if the man did make one of the ‘lewd devils lie down’. Our poet decides that he will instead gain his pleasures in ‘friendship, freedom and wine’, and does so in a rollicking duet with the bass. Instead of worshipping the goddess of love, Venus, he will turn his attention to Bacchus, god of drink, forget the troubles of the world, and fill his glass. To make the lewd devils lie down. The pleasures of friendship, freedom and wine. Sirrah! fill to the brim!